Select a sunny site with well-drained soil in an open area. Lilacs need good air circulation. Dig a hole 3X the width of the pot or ball of the plant. If you have a very small plant, be sure the hole is at least 18” across. Amend the soil with well rotted compost, a cup of lime and some fertilizer. Firm the amended soil to remove excessive air pockets. Place the top of the lilac ball slightly higher than the surrounding ground and firm more soil over and around the roots. Water well. Mulch applied to the base of the transplant helps keep the soil moist. Water your lilac twice a week for the first month, unless there are regular rains. Keep lilac well watered throughout first growing season. Pruning is best done in late March or early April, before the leaves have emerged. 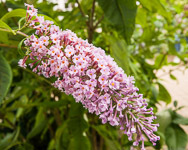 Healthy lilacs only need occasional pruning to remove dead or spindly branches. Older, taller plants will benefit by pruning out, at the base, up to one-quarter of the largest branches. Pruning forces new growth to emerge at the base and opens up the plant to more air circulation and light. It also keeps the flowers at eye level. Very old and overgrown lilacs sometimes need total rejuvenation. This may be accomplished by removing one-quarter of the oldest branches each year for four years. If your lilac produces too many suckers at the base, prune or dig out the excess. Suckers with good root systems may be potted up and given to friends or planted in another location in your garden. Lilacs in our area suffer from three types of problems. The most common disease is powdery mildew that coats leaves in late summer and fall with a silvery-white film. This disease rarely harms a healthy plant, but may look unsightly. The Common Lilac (Syringa vulgaris) and its cultivars are most susceptible to this disease. This problem may be treated with a fungicide or wettable sulfur. For best result follow the instructions on the product. Another common problem is lilac borer. This small, white larva bores into the heartwood of the lilac eventually weakening or killing the cane. It leaves a small pile of sawdust coming out of the entry hole. The best prevention is to prune out the largest, oldest growth and encourage vigorous new growth. The borer does not seem to attack young growth. Borers may be killed with a long wire put into the hole. The third problem lilacs encounter is oyster-shell scale. 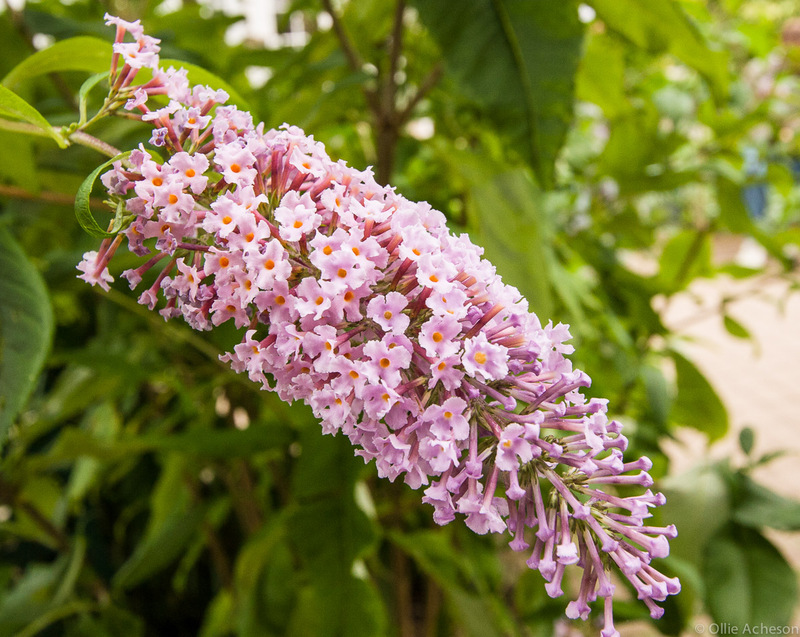 This tiny pest can rapidly cover lilac canes, weakening and even killing the cane or the entire plant. The pest is light brown or gray and may blend with the bark from a distance. Badly infested branches should be removed and destroyed. Spray with dormant oil in early spring before bud break or with summer oil or Malathion after the leaves emerge. Follow directions.